I’ve heard fond recounts of the Corner House, Herbert and Michelle Barnsteiner’s previous restaurant. Sadly, I’ve never visited the iconic establishment, so hearing the couple was back with the new Barnsteiner’s seemed like an ideal second chance. Beautifully executed meats, wonderful spaetzle, come to me now. Indeed, their food is delicious, but the kitchen’s consistency is a problem. Gordon Ramsey would throw a temper tantrum seeing the state of the dishes being served side-by-side. 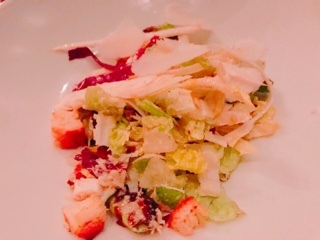 Take the charred Brussels sprouts Caesar salad: while some guests had what you’d expect the salad to be (about ten halves of roasted Brussels sprouts with other fixings), my friend and I both received a plate of what looked like a regular Caesar. After foraging around the romaine and endives, I finally found a single split sprout. To be fair, what I could salvage was delicious with a wonderful caramelized crust and the creamy dressing not overly rich with a heavy hand on the garlic. Aside from the greens, there were also large pieces of smoky bacon and plenty of shaved pecorino … just don’t expect to actually get Brussels sprouts. It felt like I was playing Where’s Waldo? with the salad. 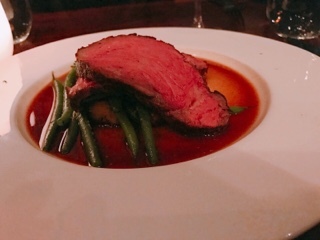 The black angus striploin’s consistency improved a bit – we all at least received two slices of the requisite beef and it was cooked beautifully (a perfect medium rare; juicy and meaty). Everyone even received similar portions of the creamy squashed roasted fingerling potatoes and crispy vericot beans. Yet, the red wine jus was a miss: one (unpictured) dish looked like someone cleaned the plate with Bounty and absorbed most of the sauce with it. While the menu describes the espresso and hazelnut pannacotta as “tiramisu-ish”, aside from the espresso and perhaps some cream, it’s not tiramisu. Nor does it need to be, as the dessert is delicious on its own. 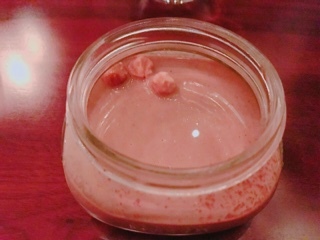 The shallow mason jar may look plain (actually all the desserts were not picturesque), but the flavour is bang on. The pannacotta has a luscious consistency and the creamy espresso sauce on top adds a wonderful flavour. It really shows, sometimes looks don’t matter. Barnsteiner is a great traditional bistro, but also has an old school mentality towards service. Sure, the staff are professional and things arrive as ordered, but there’s a utilitarian frankness to their service – good luck getting a smile or joke from anyone. Their technology also seems outdated – when we requested separate bills, we were advised that it can be done, but we should have put in the request while ordering. Maybe I’m succumbing to the millennial mindset, but other restaurants actually ask whether we want individual bills while paying … if it’s such an easy request for them, why is it such an arduous task at Barnstainer? Tip to the restaurant: if splitting checks takes preparation, consider telling staff to warn customers at the beginning the meal - a simple “and will you need separate invoices tonight?” would suffice. Don’t get me wrong, I love old school restaurants – their private dark atmospheres, spacious seating, and even mains that arrive with all the sides. There’s something comforting about them and the dim lighting means less technological distractions – why bother taking a zillion photos when they’ll be grainy anyways? It’s a shame, as Barnsteiner could have been a place I’d really enjoy – but having inconsistent food and unaccommodating service doesn’t make me want return. Maybe it’s the old-fashioned attitude or the Barnsteiner’s are comfortable relying on their previous Corner House clientele, but can a restaurant occupying a convenient location serving decent food be enough? If invited for a meal, I’ll still happily eat there, but recommend it to others? Not so much.